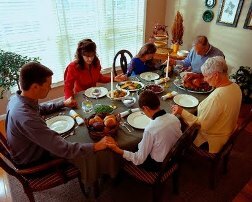 Looking For An Easter Dinner Prayer? It’s about 2:30pm on Sunday, Easter Sunday, here on the east coast of the United States. Families are starting to gather for their Easter dinner, and you might be wondering what you will say for an Easter dinner prayer. Here’s an Easter dinner prayer that is one I found while searching for Easter Dinner Prayer. God our Father, Creator of all, today is the day of Easter joy. This is the morning on which the Lord appeared to those who had begun to lose hope and opened their eyes to what the scriptures foretold: that first He must die, and then He would rise and ascend into His Father’s glorious presence. By raising Christ your Son You conquered the power of death and opened for us the way to eternal life. Let our celebration today raise us up and renew our lives by the Spirit that is within us. and that we may know Him as we follow Him each day in His risen life. We ask that you grant these things through our Lord and Savior Jesus Christ, your Son, who lives and reigns with You and the Holy Spirit, one God, forever and ever.